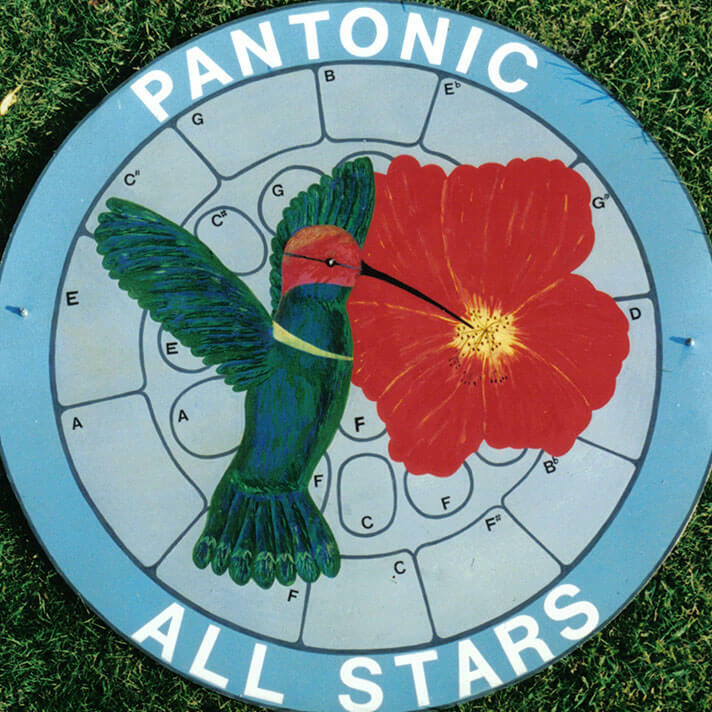 Pantonic All Stars Steel Orchestra was formed in November 1985 when two families, one of whom had recently returned from a working period in Trinidad, decided to form a steel band for the benefit of children in Stockport. From those ideas the band grew into an orchestra which has raised and extended the scope of steel music not only locally and regionally but nationally. 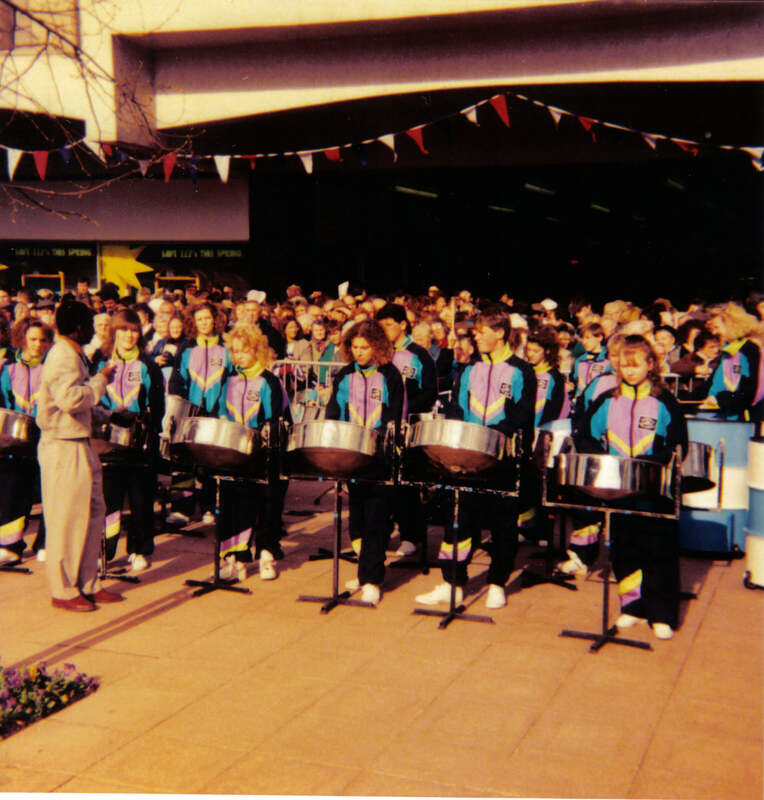 Back in 1985 the Orchestra, under the tuition of Arthur Culpepper, started with steel pans obtained from several sources, and as funds became available from playing out and charitable sources, expansion was possible and chrome plated instruments were purchased which provided better quality and durability. Rehearsals were held in the drama studio at Dialstone Community Centre in Offerton, Stockport from 1985 until 2003 when a new home had to be found and we moved to Hazel Grove Primary School. Expansion of that school in 2015 forced us to look for new premises and we were fortunate to be offered the use of the Sixth Form block at Hazel Grove High School, where we continue to provide our regular rehearsals. In 1987 the Orchestra made its first visit to Beziers, Stockport’s twin town in the south of France. This was followed by a short trip to Belgium in 1988. The Orchestra took part in a number of competitions but most notably in the National ‘Music for Youth’ Festival where they were presented with the Outstanding Performance Award twice and performed at many School Proms concerts including St. David’s Hall, Cardiff, St Georges Hall, Bradford and the Royal Albert Hall, London, where they were fortunate enough to make four appearances between 1989 and 1995. Most memorable being 1992 when we played Bohemian Rhapsody on the first anniversary of Freddie Mercury’s death with the spontaneous full backing of a Welsh girls choir. The Orchestra has also been featured several times on television and radio in arts festival and youth programmes including Blue Peter (twice!) and the ‘Young Entertainer of the Year’ semi finals on BBC1. Were you there on the photos from this era? This performance of a Queen tune came just a year after the Orchestra had played for Her Majesty Queen Elizabeth 2nd when she had attended a ceremony in Mersey Square, Stockport. Photos and a letter were the pride of the collection! The Orchestra has been primarily responsible for progressing an art form by its extension into pop and light classical music, as well as performing traditional music from its musical source, particularly calypso. In 1989 they recorded its first cassette using the famous Strawberry Studios in Stockport. Further recordings followed in 1991 and 1993 and then two years later these latter two were combined to create the first CD. The drama studio at Dialstone Community Centre has been used to record most of the music collections and three further CDs have been recorded since 1997 with cassette versions of all but the latest volume 6, which was recorded at the Royal Northern College of Music in December 2004. 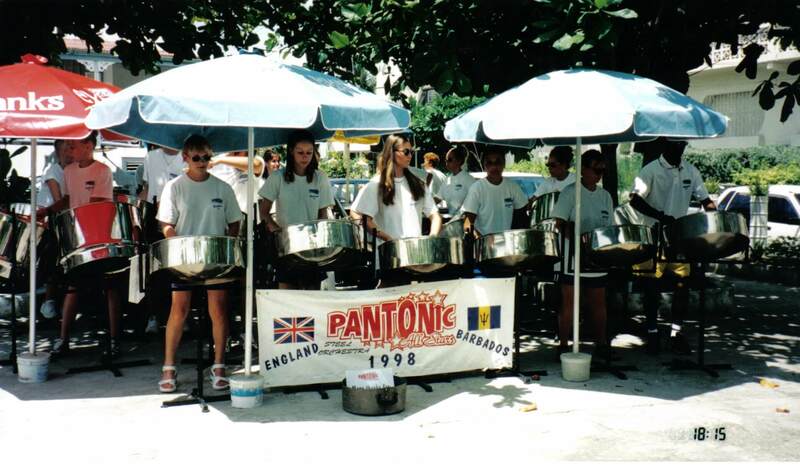 The style of music on all the recordings is deliberately varied to re-create the traditional sound of the Caribbean, whilst demonstrating the wide versatility of steel pans. Easy listening and modern tunes are mixed with a selection of calypsos and some of the well-known classics, initially arranged by Nigel Brathwaite and then from 1991 till 2004, by our third Musical Director Scott Sinckler. Volume 7 CD was recorded in 2010 and all the new and revamped arrangements were arranged by our fourth Musical Director, Steven Marshall, who originally joined the Orchestra as a junior player back in 1987. Steve’s family commitments caused him to take a less active role in tutoring and Paul Handley became our fifth Musical Director. Paul had joined us in 2004 as an experienced player and together with Steve, John Unwin and Ash Hogg, long serving percussionists, the strengths and Caribbean style of the Orchestra have been maintained. In the late 1980’s player transport was achieved through a 12 seat Bedford minibus, followed in 1991 by a local coach company donating a 15 seat mini coach – the lovable ‘Bubble’ for obvious reasons. In summer it was like driving a greenhouse. The first transport for the pans was an old caravan with some glass missing that once allowed a pan to bounce along behind the group. A Ford Transit Luton was replaced by a second Transit supplied by Asda and presented to us by local folk singer and comic Mike Harding, in 1991. This second one proved to be a bit too small and soon had to be modified with a tall roof to accommodate the growing group. A loaned trailer, and later our own trailer, provided us with the ability to carry two five piece bass sets. With a need to become more reliable and widen our horizons for playing, we applied for a grant from the National Lottery. This was achieved through the Arts Council in the summer of 1997, and enabled the Orchestra to obtain a 17 seat Iveco Daily minibus, which provided the necessary transport to extend both the number of venues and geographical area that the Orchestra could cover. The grant also enabled us to procure a second long-wheel base Iveco Daily to transport the large volume of equipment that is required to provide the musical entertainment. Not to be outdone we picked the newly registered van up on August 2nd, the minibus six days later, and set off on the 10th for our first fortnight tour of Torbay in Devon – thank heavens they were reliable! . In 2009 we were able to replace the aging van with a new and more efficient Iveco Daily and then in early 2013 we were fortunate to be offered a newly converted Mercedes Sprinter minibus at the right price, which has made long journeys much more comfortable. The Orchestra’s own funds, together with the National Lottery grant, have enabled regular capital purchases of musical instruments, uniforms, cases and stands to reach the stage where we can accommodate, if pushed and with percussion, a group in excess of 40 young players. The vast majority of our pans were made by Biggs in London until his death in 2007, since when we have used Toussaint Clarke in Bath for tuning and to buy three new tenors and a set of bass. In addition the new equipment has allowed us to support our local primary schools by passing on our old pans to their bands and this in turn provides us with a supply of new young talent to keep the Orchestra alive. The Orchestra regularly appears at Caribbean evenings, shows, garden festivals, carnivals and shopping precincts taking on over 50 events each year throughout the Country. Recent years have seen the Orchestra tour Devon regularly in eight summers – watch out for 2018 – as well as covering a wider field taking in all the northern and midland counties, Scotland and North Wales. The Orchestra receives donations for playing at public and private functions and a local authority grant which, together, provide some of the funding required to operate the existing vehicles, and support our other operational costs. These include foreign visits and, as well as those mentioned above, the Orchestra has performed in Europe on many occasions, visiting our other twin town Heilbronn, Germany in May 1993 (Were you there? ), touring Barbados in August 1998 (Were you there?) and revisiting Beziers and Valras Plage in France for two weeks playing in the summer of 2004 (Were you there?). We made our first tour to Esbjerg in Denmark in February 2007, (Were you there?) to undertake workshops and concerts for the youth service as well as some public venues. This week-long trip in half-term had wet our appetite for more, so when in late 2008, our youth service contact in Esbjerg decided to hold an international steel band festival with bands from Sweden, Denmark as well as England, we jumped at the chance. In August 2009 (Were you there?) the second two week tour started with the three day Esbjerg Steel Music festival followed by playing events at venues around the area. August 2017 will find us in various towns in Belgium for a five date tour, so more about that later in the year. Three successful anniversary concerts have been held, with the tenth at Stockport Town Hall in 1995 and the fifteenth at The Plaza, Stockport just as it reopened for business in 2000. 2010 brought the 25th Anniversary of the Orchestra and we were partying with nearly forty ex-players that we had been able to contact through the advantages of Facebook etc. together with the same number from the current group and plenty of parents and friends old and new. In October 2015 we celebrated our 30th Anniversary by holding two evening concerts at Hyde Festival theatre. The concerts were videoed and the live recording has been produced on our Volume 8 CD. Nationally the Orchestra has a high reputation in steel music and needs to support its continuing development, not only as an orchestra, but for the contribution it can make to extending a musical forum and reaching audiences throughout the country by performances at both public and private events. It continues to develop steel music as an art form and to produce the quality of music for which they have become respected and well known in the steel music and Music for Youth forum. This is further supported by the constant request from local primary schools and local young people to join the orchestra. This growth, even with those leaving the orchestra, has risen from 25 in 1992 to today’s total of over 50.